Singapore's great weakness is that it is an absurdly small nation. Paradoxically, one great strength of Singapore is that it is an absurdly small nation. Hence, Singapore can try things out on a national scale that few other nations can dream about. Let me suggest one such bold national project. Let Singapore become the first country in the world to have an all-electric fleet of vehicles: cars, trucks, taxis, buses, etc. Singapore can create a new chapter in world history by becoming the first country in the world not to have petrol-fuelled engines on the road. And why should Singapore do this? There will be at least three massive benefits from doing so. First, Singaporeans will breathe much cleaner air. Without petrol and diesel engines, there will be much less carbon monoxide, nitrous oxide, particulate matter and other pollutants in the air. As a result, I have no doubt that the health of Singaporeans will improve. There will be fewer instances of asthmatic attacks, and incidents of cancer may also go down. Singapore will also become the quietest city in the world. Second, Singapore would be positioning itself for the day when a global carbon tax or emissions trading system is introduced. The United Nations Intergovernmental Panel on Climate Change just released its latest climate change report. The evidence is now irrefutable. Human activity, especially in the form of greenhouse gas emissions, is warming the planet. Many countries will suffer the negative effects of rising sea levels and bouts of extreme weather. Singapore will be one of the biggest losers if the worst-case scenario unfolds. While Singapore is too small to make a large difference to climate change mitigation efforts, an all-electric fleet would help us deal with a global carbon tax, thus boosting national competitiveness. By creating an all-electric transportation system, Singapore can help to delay climate change. How? Singapore’s behaviour alone will not make a massive difference. But bear in mind that the Asian middle-class population is about to explode, from about 500 million now to 1.75 billion by 2020. If these new middle-class citizens begin buying petrol-burning cars, the planet will be literally, not metaphorically, fried. Clearly, some powerful examples will be needed to demonstrate that the world would be better off not buying petrol-burning cars. By going all-electric, Singapore will act as a key catalytic agent to help to prevent global warming. 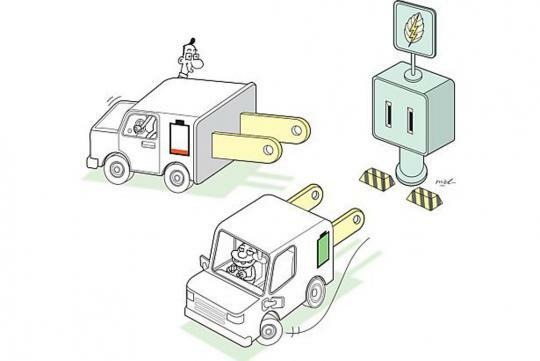 The manufacture of electric cars emits more carbon than that of traditional vehicles because of the energy-intensive methods used to mine, smelt and process the iron, lithium and rare earth elements that go into the batteries and other components of electric cars. But studies have shown that electric vehicles make up for this by having much lower carbon emissions when they are in use. Most of Singapore’s electricity is generated from natural gas, a relatively clean fossil fuel. Using electric cars will result in an effective 66 percent reduction of carbon emissions in comparison with petrol- and diesel-powered cars. The third benefit of creating an all-electric fleet is that it will help to reduce the obsession with cars as a status symbol, as electric cars will simply be seen as functional vehicles to get from point A to point B. For the few Singaporeans who insist on having status symbols like Maseratis, Ferraris and Lamborghinis, I would like to strongly recommend the Tesla, the environmentally friendly status symbol. By moving to an all-electric fleet, we shift the status competition in Singapore away from having the most powerful and fastest cars to having the most environmentally friendly ones. So who should lead the charge to convert Singapore’s car fleet into an all-electric one? I think I know what is going on in the mind of any Singaporean who is reading this sentence. Every Singaporean will expect the Government to take the lead. Unfortunately, this is the wrong answer. If the Government tries a top-down strategy, there will be a lot of resistance. The only way such a massive change can take place smoothly is for it to be a bottom-up initiative. Indeed, as Singapore approaches the 50th anniversary of its independence and Singaporeans ponder on the next 50 years, the country should consider a major change of approach to the future development of the country. Singapore has been extraordinarily successful in our first 50 years because of a remarkable number of government-initiated policies. Let me just cite Singapore Airlines, Changi Airport, PSA, and the Singapore Newater story as a few examples. None of these were citizen initiatives. However, for the next 50 years, we will need a balance of government-led and citizen-led initiatives. Making Singapore the first electric vehicle nation should be the first citizen-led initiative in the nation’s history. Anyone who thinks that a single citizen cannot make a significant difference should look at the record of Tesla Motors and its chief executive Elon Musk. Mr Musk is giving a personal guarantee (including with his personal money) that the Tesla will retain as much second-hand value as the equivalent Mercedes. Even more astoundingly, he has begun building charging stations so that you can drive from Los Angeles to New York in a Tesla. If you can drive across a large country like the United States in an electric vehicle, it is surely possible to do so in Singapore. No charging station in Singapore will be more than a few kilometres away. In fact, charging stations could even be installed in private parking lots and driveways. The Government can help by creating an infrastructure that supports electric vehicles. It could also provide tax and other benefits. Currently, because of the high cost of electric vehicle batteries, such cars cost more, thus placing the vehicle in a higher tax bracket than cheaper but less environmentally friendly cars. Even the recently introduced Carbon Emissions-Based Vehicle Scheme (CEVS) does not offset the higher costs. Sadly, Tesla had to close its dealership in Singapore without selling a single fully electric car after less than a year because it was not able to receive “green tax benefits” from the Government. But the benefits that would flow from the creation of an all-electric fleet would be far greater than the tax revenues that the Government stands to lose in giving out tax benefits. In short, it is a “no-brainer” for Singapore to become the first country in the world with an all-electric vehicle fleet. No other country can do it as easily as Singapore. The benefits in all dimensions - environmental, health, social - will far outweigh any costs. Indeed, I cannot think of any real cost to making the change. So the big question is: Which citizen of Singapore will stand up and take the lead? If the movement succeeds, it will “electrify” both Singapore and the world. The hour has come. Let the right man or woman stand up and lead the movement. I think it's quite clear why Singapore most probably will not focus on an all electric cars population. It's like chopping off the hand that feeds you. And what about long driving trips to Malaysia?